Beating Colds & Flu Naturally | Fabulous Nutrition - London based nutritional therapy clinic. 66 to 75% of colds are caused by 200 different viruses which is why there is no effective anti viral for the common cold. For the Flu, a jab may be on offer, but the leading doctors only recommend those for people at high risk, given the potential for side effects and development of resistance. Drink plenty of fluids, especially warmer fluids. Central heating during the winter can make it more difficult to stay hydrated, so make sure you drink enough water. What’s enough? Take your body weight in kg, multiply by 31, that gives you the ml of water you should drink per day: Make soups and broths with fresh vegetables (batch cook and freeze), drink green tea, herbal teas, especially ginger and echinacea. Have a good protein source with each meal or snack. Amino acids in proteins are the building blocks of life, all our immune cells and detoxification systems need those aminos to function! Beans, pulse, seeds and nuts are good vegetable protein sources. ‘Clean’ & “lean’ are the key words for animal proteins, that means organic or wild wherever possible and cuts without excess fat. Season your food with garlic, onions, ginger, turmeric & cayenne pepper. All of which have antioxidant, detoxification and antimicrobial properties. Eat more vegetables & fruit. 5 a day is really the bare minimum, if you want to be optimally healthy then have 6 or 7 different coloured vegetables and 2 or 3 pieces of fruit. So that’s 3 veggies with each lunch and dinner, a piece of fruit as dessert or with breakfast or as a snack (with nuts & seeds). They are packed with vital vitamins, minerals & phytonutrients and your body will thank you for it! Cut out the refined carbohydrates and simple sugars. Research has shown that sugar can suppress the immune system for hours after eating, so sugary cakes and sweets are the worst thing if you are feeling sick. Replace refined ‘white’ carbohydrates with whole ‘brown’ ones that provide the important B vitamins and have a slower release of energy and sugars. Eat enough of the good oils. Fats are not all bad, we really need the essential fatty acids for optimal immune function; 3 portions of oily fish a week will do it. Plus add a handful of seeds and nuts to meals or snacks or in a dressing most days, the best choices are pumpkin seeds, sunflower seeds, sesame seeds, walnuts, flaxseeds & almonds. Get enough sleep. 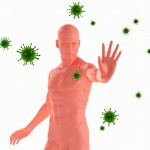 It’s when the body rests and repairs so vital for a good immune system. Get into a rhythm especially for these winter nights and aim for seven or eight hours a night. Use relaxation and breathing exercises to help unwind and to keep you stress free through the day. Take regular exercise. Regular exercise will keep you in optimal health, but if you are run down then excessive exercise will be an added stress on the system. So keep fit but don’t push yourself when you feel a cold coming on. Interesting read – thanks for this, found you searching on Google.